At first glance, it looks like an image straight out of Time Magazine: a toothless old woman holds a small child in her arms as she walks down a crowded street in India. Just another photo spread on world poverty, right? Wrong. 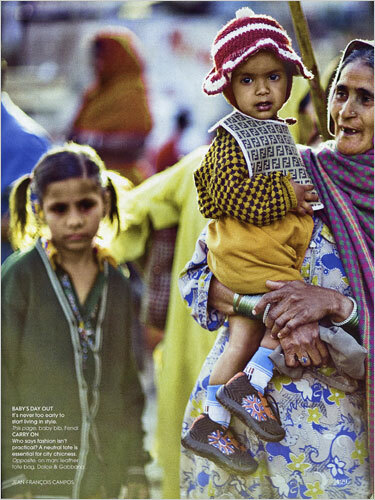 The image is from a recent photoshoot from the September issue of Vogue India and the child is wearing a Fendi bib worth $100. 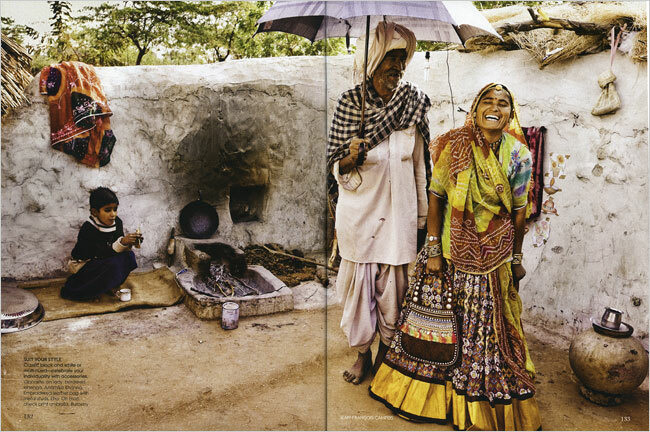 For the photo shoot, Vogue used everyday Indians instead of models to display the high-end products, arguing that “fashion is no longer a rich man’s privilege.” In response to criticism that the spread was “tasteless” and “vulgar,” Vogue India editor Priya Tanna huffed, “Lighten up … We weren’t trying to make a political statement or save the world.” But is flaunting Hendi scarves and Gucci coats on people who will never be able to afford them really the best idea? If anything, this article does raise the difficulty of marketing high-end goods to Third World countries. Emerging upper and middle classes in China and India have created a definite consumer base for high-end products, but there is still a delicate balance to be struck between creating “brand awareness” and doing so in a way that is sensitive to millions that remain in poverty. For all the potential that India’s new wealthy classes present, the fact remains that over half of the 456 million population subsist on less than $1.25 a day. And in this image, a barefoot Indian man poses with a Burberry umbrella worth $200. In other high-end news, hard times have been hard for everyone lately, the rich and famous including, and high-end retailers have been pulling out all stops to lure their typically free-spending customers from their recently thrifty habits. Saks Fifth Avenue recently expanded its online content to cater to the younger, YouTube generation with a “virtual catalog” that includes several how-to beauty videos and video clips displaying products from the likes of Zac Posen, Dior, and Mark Jacobs. And Bloomingdale’s is launching a music-themed campaign in November, complete with print ads and live performances by musicians. Hopefully these campaigns will go more smoothly than Vogue India’‘s photo shoot! Previous Previous post: The Rise of the Hispanic consumer: ¡Olé!